Wishes Script is a complete calligraphic handwritten typeface created by Sabrina Mariela Lopez and published by Typesenses. With gorgeous flowing lines and over 990 glyphs, Wishes Script features, beside the standards, swashes, endings, ligatures, frames, ribbons, hearts, flowers, a lot of ornaments and all the alternates you would possibly need. It is perfect for wedding invitation, magazine, logos, packaging, posters, fashion etc. 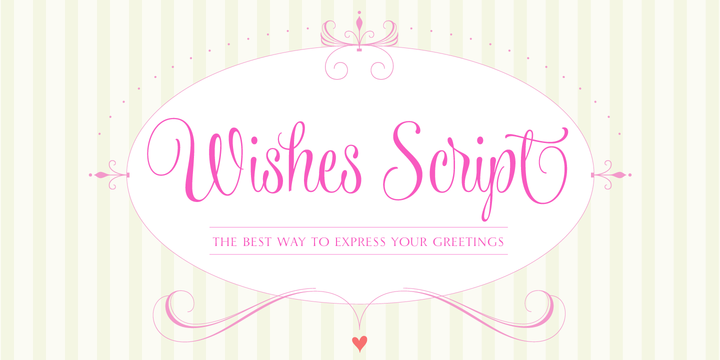 Make your wishes true with Wishes Script! A font description published on Friday, April 12th, 2013 in Fonts, Sabrina Mariela Lopez, Typesenses by Alexandra that has 14,394 views.